The inspectors noted that in end of life care: "Members of staff, in conjunction with patients, developed a model to address the emotional concerns of patients or their caregivers. This is now a nationally recognised communication model and the trust was a national leader in training in emotional support." The Shelford Group is a collaboration between ten of the largest teaching and research NHS Trusts in England (including Trusts in Cambridge, Oxford, London, Birmingham, Newcastle, Sheffield and Manchester). The Group was formed in 2011 and aims to shares learning between members and initiate joint projects for large-scale improvement in the NHS. Many NHS Trusts use data from the leading Shelford organisations to benchmark their own performance. Nine of the NHS Trusts within the Group run the SAGE & THYME Foundation Level workshop - either under their own licence, or under a network licence held by another organisation. This demonstrates how SAGE & THYME training is now the most established foundation level communication skills training programme for NHS staff. For the start of 2019, the SAGE & THYME Foundation Level workshop has been revised and updated, following consultation with a number of SAGE & THYME facilitators. improving the materials in the delegate packs (including a new handout on using the SAGE & THYME structure in conversations). Organisations running the workshop now have 3 months (until the end of March 2019) to transition over to using the new presentation in all the workshops they run. The revised presentation (which includes new 'stick' men) explains each step of SAGE & THYME more clearly and a number of SAGE & THYME facilitators have contacted us about how much they like it! Doctors and other healthcare professionals find it hard to talk about dying, states a new report from the Royal College of Physicians, 'Talking about dying: How to begin honest conversations about what lies ahead'. We run a 3.5 hour workshop called 'SAGE & THYME ACP', which teaches health and social care professionals how to open a conversation about advance care planning and to deal with the patient's concerns as they arise. To organise a SAGE & THYME ACP workshop in your area, please contact us. This year’s Study Day is on Tuesday 13th November at Wythenshawe Hospital in Manchester. The event includes: presentations from organisations running SAGE & THYME training across the UK; updates from the SAGE & THYME team on issues such as the change in the way SATFAC feedback is given and running the workshop; and an interactive discussion session. We recommend that at least one person for each SAGE & THYME licence attends the day to ensure that your organisation is up to date on any new developments. The early bird fee (for booking before 17 September 2018) is £60 per person and the fee thereafter is £80 per person. Fees charged simply cover the costs. We are currently organising speakers and workshops, and will advertise the programme once finalised. Manchester University NHS Foundation Trust has been shortlisted for a Nursing Times 'Enhancing Patient Dignity' award for its work on SAGE & THYME. The award submission was entitled 'Giving every patient their voice - teaching every nurse how to listen'. 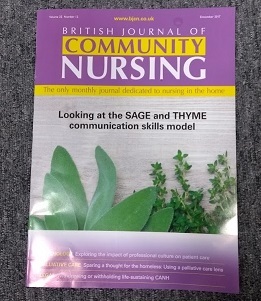 It explains how the memorable structure of SAGE & THYME helps nurses and others to use evidence-based skills in conversations with patients, as dignity in care starts with patients being carefully listened to. Winners will be announced at the award ceremony on 31 October 2018. To mark 10 years of collaboration between Macmillan Cancer Support professionals and SAGE & THYME, an article has been published in Macmillan's summer edition of its 'Mac Voice' magazine. The article, written by Mike Connolly (Lead Trainer of SAGE & THYME and Consultant Nurse in Supportive and Palliative Care at Manchester University NHS Foundation Trust), talks about how Macmillan was an early adopter of the SAGE & THYME Foundation Level workshop and that to date it has supported more than 230 professionals to become SAGE & THYME facilitators. Click here to read the article (on page 14). Dying Matters week is an annual event to raise the profile of talking about dying, death and bereavement. Giving a terminally ill person the chance to plan their end of life, allows them to indicate their wishes around their care when their condition deteriorates, in the event that they no longer have the capacity to make decisions, and/or the ability to communicate their wishes to others in the future. These wishes are recorded in an advance care plan. Professionals responsible for discussing advance care planning with patients include GPs, senior nurses and social care staff. They often report that they don't know how to open such discussions and then structure the conversation, whilst supporting the patient with their concerns. The SAGE & THYME for Advance Care Planning (ACP) workshop teaches staff who have knowledge on the processes and procedures (e.g. Gold Standards Framework) around ACP, how to speak with patients. Listening to patients is a key part of their care in the NHS. Helping them to talk through their concerns can provide effective support, by allowing patients to think clearly and consider what might help them. Foundation level communication skills facilitate listening to patients and the SAGE & THYME Foundation Level workshop is believed to be the most widespread training programme teaching these skills - it is currently being taught in 1 in 5 acute, community, mental health, and ambulance Trusts in England. 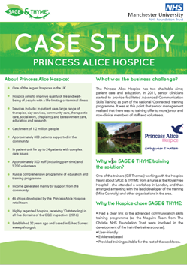 Princess Alice Hospice is one of the largest in the UK, with around 500 staff and 1,200 volunteers (including retail team and drivers involved in fund raising). It has been rated ‘outstanding’ in all 5 domains of its last Care Quality Commission (CQC) inspection. SAGE & THYME was adopted by the hospice because, whilst advanced communication skills training existed for senior medical staff; there was nothing available for junior clinical staff and also non-clinical staff and volunteers who also come into contact with distressed (and sometimes bereaved) people. Hospice UK has recently announced that two types of Wolfson Foundation education bursaries are open for application: one is for care home nurses and healthcare assistants; and the other is for hospice staff (nurse, healthcare assistant, doctor, allied health professional, or social worker). The aim of the bursaries is to provide education for staff that will lead to improving the quality of end of life care for their residents, patients and families. The SAGE & THYME facilitator ('SATFAC') course is on the list of eligible courses for the bursary. There is a limited pot of funding available for the bursaries so early applications for the funding are encouraged. For more information on how to apply for a bursary, click here. A summary of the evidence of the impact of the SAGE & THYME foundation level workshop was presented as a poster at the UK Oncology Nurse Society in Harrogate today. Today, University Hospital of South Manchester NHS Foundation Trust (UHSM) joined with Central Manchester University Hospitals NHS Foundation Trust (CMFT), to form Manchester University NHS Foundation Trust (MFT). We will be updating the web site and all SAGE & THYME documents with the new organisation name in due course. The lead developer and head trainer of SAGE & THYME, Michael Connolly, will be presenting a poster on SAGE & THYME at the UK Oncology Nursing Society (UKONS) conference on Friday 10 November. The conference takes place in the Harrogate Convention Centre and the poster summarises the research evidence on the impact of the SAGE & THYME Foundation Level workshop on staff communication skills. The SAGE & THYME foundation level workshop has been evaluated by The University of Northampton Institute of Health and Wellbeing, as one component in a series of multi-professional and multi-agency training courses run, to ensure the delivery of high quality services to frail and older people in Northampton. 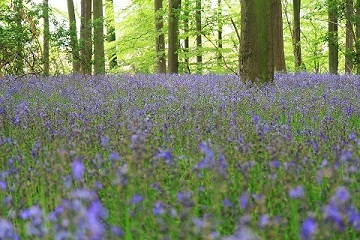 The Northamptonshire Local Education and Training Council (LETC) received funding from Health Education England to run and evaluate a suite of training courses (including SAGE & THYME) centred around: prevention and enabling self-care; geriatric assessment and personalised care planning; management of long term conditions; and end of life care. The SAGE & THYME foundation level workshop was delivered by the Northamptonshire Healthcare NHS Foundation Trust. The University’s report highlighted that the SAGE & THYME (S&T) workshop “engenders a sense that this was a well presented, easy to follow communication course which could be applied to practice easily”. Today marks the start of the annual Dying Matters Week, designed to raise awareness about the importance of talking about and planning dying, death and bereavement. 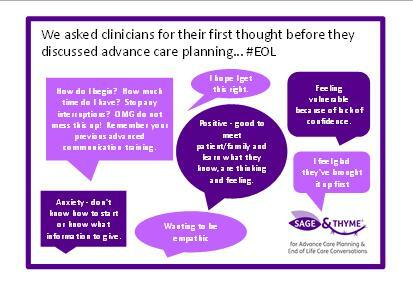 To coincide with this campaign, we have a series of Tweets available @SAGEandTHYME_ that highlight: why advance care planning is important; what clinicians are thinking before they discuss an advance care plan with patients and their carers; what the SAGE & THYME for Advance Care Planning workshop covers; and the outcomes of the training. Oxford University Press have recently published the second edition of the 'Oxford Textbook of Communication in Oncology and Palliative Care', which contains a whole chapter on the SAGE & THYME model, written by Michael Connolly (the lead developer of the SAGE & THYME training). and how the SAGE & THYME foundation level workshop can be adopted by other organisations. The SAGE & THYME team ran another successful webinar on ‘how to generate senior support for your SAGE & THYME training programme’ last week. The webinar featured guest speakers: Sue Heatley from Central Manchester University Hospitals NHS Foundation Trust (CMFT) and Vicki McLoughlin from Salford Royal NHS Foundation Trust (SRFT). It was presented by Mike Connolly and hosted by Joanne Thomas from the SAGE & THYME team. Sue and Vicki talked about how they gained senior support and how they have continued to maintain this. Mike then ran through a list of lessons learnt from other organisations and covered some dos and don’ts. Do you know how to generate senior support for your SAGE & THYME training programme? The special guests on this webinar will be: Sue Heatley, Modern Matron for Community and CKD at Central Manchester University Hospitals NHS Foundation Trust, and Vicki McLoughlin, Palliative and End of Life Care Practice Development Lead at Salford Royal NHS Foundation Trust. Both Sue and Vicki have been running the SAGE & THYME foundation level workshop in their Trusts for over 6 years. 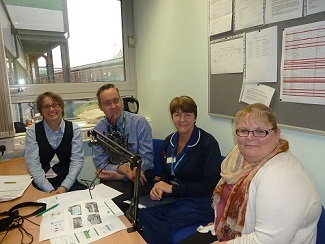 The interviewer will be Mike Connolly, Head Trainer of SAGE & THYME and Macmillan Nurse Consultant in Supportive and Palliative Care at University Hospital of South Manchester NHS Foundation Trust; and the webinar will be hosted by Dr Joanne Thomas, Senior Technology Manager at TRUSTECH and the business lead for SAGE & THYME. To register to attend the webinar, please contact us at: sageandthyme@uhsm.nhs.uk. The Nursing Times has just published a review on the benefits and barriers of ensuring patients with life-limiting diseases have advance care planning. Advance care planning allows people to be more aware of that they may die, consider their options, and make choices about their end of life care whilst they still have the capacity to do so. It also increases the use of palliative care services, which focuses on symptom management and can increase quality of life for the patient and their family. The report highlights that despite the benefits of advance care planning, a recent survey found that only 5% of people have an advance care plan or living will. The barriers to discussing end of life include: the difficulty in initiating conversations; lack of clarity regarding which healthcare professional is responsible; determining when the discussion is needed; the worry about upsetting the patient; and knowing which documents to use to record the patient's wishes. The review explains that it is important that nurses and doctors have the right training so that they can initiate and manage conversations about advance care planning. The SAGE & THYME for Advance Care Planning and End of Life Care workshop gives clinicians an evidence-based, memorable, structured approach that they can immediately use with their patients. Today we are launching our first Twitter campaign to promote the SAGE & THYME model and the SAGE & THYME foundation level workshop. We will be posting daily tweets for about 3 weeks. Our Twitter handle is @SAGEandTHYME_. Please retweet our messages and use the following hashtags for comments and questions: #SAGEandTHYME and #SAGEandTHYMEtraining. 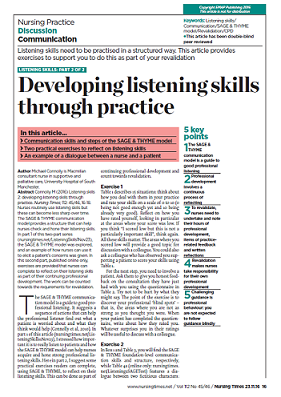 The Nursing Times has published (on 21 Nov) two articles on listening skills for nurses: the first (part 1) describes how the SAGE & THYME model can be used as a 'satellite navigation system' to listen and respond to patients' concerns; and the second (part 2) provides exercises to practice listening skills for revalidation. The articles were written by Mike Connolly, the lead developer of SAGE & THYME. 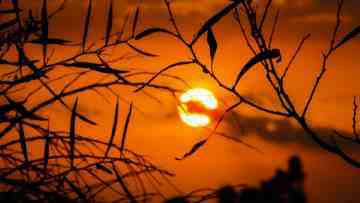 The World Health Organization (WHO) has issued a guide to planning and implementing palliative care services, which puts communication skills at the core of such services. The WHO recommends that communication skills training is received by: untrained and trained community-based volunteers, community health workers, hospital-based doctors and nurses for adult and children’s services, paediatric auxiliary nurses, paediatric social workers, teachers, chaplains and neonatologists. The SAGE & THYME foundation level workshop can provide the competencies needed by providing non-advanced communication skills training. The sample curriculum for a 16 hour training programme for community volunteers suggests that they have 6 hours covering: basics of communication, breaking bed news, addressing emotional reactions and offering emotional support. The SAGE & THYME foundation level workshop lasts only 3 hours and covers the basics of communication, addressing distress and concerns and teaches how to offer patient-centred emotional support. The Academy of Fabulous Stuff is devoted to sharing ideas and best practice in the NHS. The aim is to make NHS services "better, quicker, safer, more reliable and cost effective". The SAGE & THYME foundation level workshop teaches evidence-based effective communication skills regarding how to notice distress, hear concerns and respond helpfully and it is suitable for the whole work force. The SAGE & THYME for advance care planning (ACP) and end of life conversations teaches senior staff how to open a conversation about dying, listen to patients, respond to their distress and support them using an evidence-based patient-focussed approach. Both the SAGE & THYME foundation level and ACP workshops are now being disseminated around the NHS via the Academy of Fabulous Stuff web site. Recruiting and engaging patients in research, is a skilled activity because patients have worries and fears about their illnesses. Researchers have set questions, but starting the conversation with patients and responding to worries, requires specific training. The North West London Clinical Research Network commissioned some SAGE & THYME foundation level workshops for their research staff to attend. The staff rated their willingness to talk to people who are emotionally troubled between 8 and 10 (out of 10) after attending the workshop and 84% said would recommend the workshop to others. The recording of the evidence behind each element of the SAGE & THYME model and also the impact of the SAGE & THYME foundation level workshop is now available. 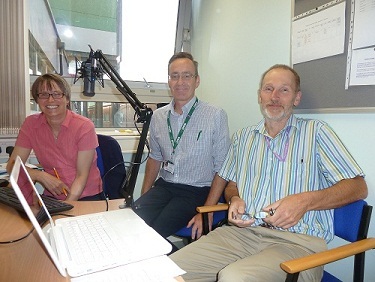 The webinar was hosted by Dr Joanne Thomas and presented by Mike Connolly and Dr Simon Cocksedge. We will be hosting our second webinar entitled 'Understanding the evidence behind SAGE & THYME foundation level workshops' on Thurs 22 September 2016, 2:00-2:45pm. The presenters will be Michael Connolly, Simon Cocksedge and Joanne Thomas. They will be discussing the evidence behind each element of the SAGE & THYME model and also the evidence on the impact of the SAGE & THYME foundation level workshop. London Cancer, the Integrated Cancer System for North East and Central London and West Essex, promotes comprehensive and seamless cancer care for patients in its area. This includes running a level 2 psychological skills training course for healthcare professionals caring for cancer patients. The prerequisite for attending this course is that professionals have attended a SAGE & THYME foundation level workshop (which covers level 1 psychological support). Dr Mark Barrington, Chair, Psychosocial Expert Reference Group for London Cancer said, “SAGE & THYME is a deceptively simple method for managing complex interactions with patients. It helps professionals to show both that they care and that they value a collaborative approach to problem solving”. The SAGE & THYME for Advance Care Planning (ACP) and End of Life Care workshop features in the latest edition of the Innovage magazine (issue 14), published by Edward Centre for Healthcare. Written by Mike Connolly, the article talks about 'knocking gently on the door' in order to open up conversations with patients and their carers about their future wishes and plans before they may lose the capacity to express them. It also highlights two systematic reviews of the literature on the subject. To read the article (page 10), please click here. 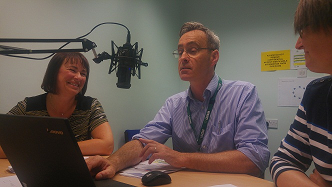 The first ever live SAGE & THYME webinar was broadcast last week (14 July) by the SAGE & THYME Team. It was aimed at SAGE & THYME facilitators and it covered choosing useful scenarios for rehearsals in the SAGE & THYME Foundation level workshop. Over 50 people attended the webinar and stayed for the whole session. Several facilitators sent the team positive feedback after the event. A link to the webinar recording has been sent to all SAGE & THYME facilitators and key contacts. It is also available from the trainer area of the website. Salford Royal NHS Foundation Trust's end of life care has been rated by the Care Quality Commission (CQC) as 'outstanding'. The Trust's commitment to providing high quality end of life care, includes ensuring that all staff involved in dealing with patients and carers, have the right skills. 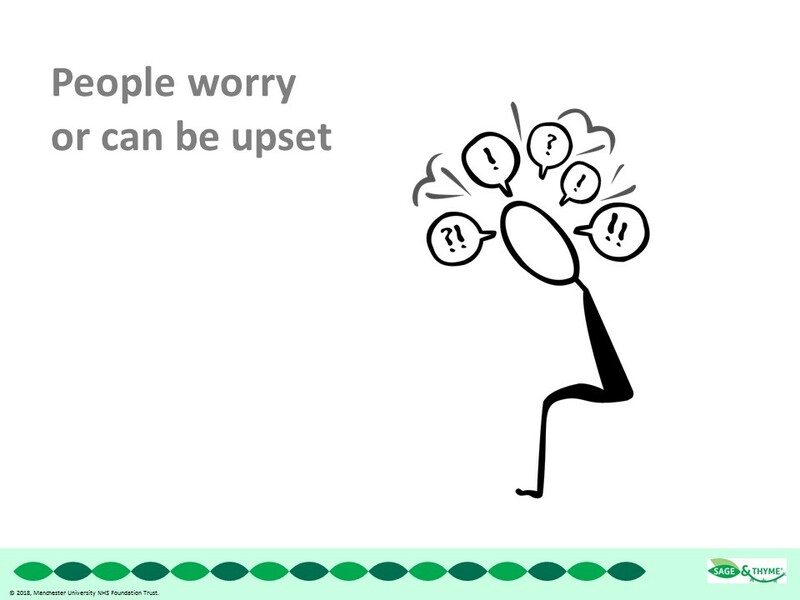 It therefore runs the SAGE & THYME Foundation Level workshop as part of its training programme, to teach staff how to recognise distress, and communicate with someone who is upset or has concerns, whilst providing basic psychological support. We are launching a series of webinars to allow everyone to access updates and information on SAGE & THYME and related issues without having to leave their place of work. The first webinar will take place on Thursday 14 July, 2:00-2:45pm on choosing useful scenarios. To find out the dates of the other webinars planned and to book a place, please click here. Announcing our official twitter account! We are pleased to launch the new SAGE & THYME twitter account @SAGEandTHYME_ which we hope will be a platform for communication and for sharing relevant information. We hope that many of you choose to follow us! Read more about Announcing our official twitter account! The Royal College of Physicians 'End of Life Care Audit - Dying in Hospital: Nation report for England 2016', published on 30 March 2016, highlights how important it is for staff involved in care of the dying to have: good communication skills; the ability to listen to patients' concerns; and the skills to conduct advance care planning. The latest research on the SAGE & THYME Foundation Level workshop, conducted by the University of Manchester in collaboration with Leeds Teaching Hospitals NHS Trust, will be presented at the NET2016 conference in Cambridge on 6-8 September 2016. The research focuses on the barriers and facilitators to implementing a communication skills model in practice and bridging the theory practice gap. Mike Connolly will be presenting an abstract at the RCN Education Forum National Conference on Tues 15 March 2016 (International Centre in Telford) on 'teaching foundation level communication skills using ‘SAGE & THYME’ in clinical practice and in the nursing curriculum'. The presentation will be delivered at 12:30pm (concurrent session 1.3.4) and Joanne Thomas from the team will also be attending, along with Mike, to answer any questions. If you're attending this conference, please come and see us in our session. A review on end of life care services, entitled 'Better Endings', has been published by the National Institue for Health Research (NIHR) Dissemination Centre (Dec 2015). The review considers how patients at the end of their lives should receive the right care, at the right time and in the right place. Research has shown that whilst good care of dying patients includes complying with the patient's wishes, an advanced care plan (ACP) is not always completed for each patient. One reason for this is that staff can find it difficult to initiate such discussions. The SAGE & THYME ACP workshop teaches healthcare professionals how to open a discussion about advance care planning and also manage any concerns that a patient may have, to ensure that their patients receive the right care, at the right time and in the right place. The SAGE & THYME programme has been shortlisted for the Bionow Healthcare Project of the Year award. Mike Connolly will be attending the prestigious Bionow Annual Awards Dinner at The Mere Golf Resort & Spa (in Mere, Cheshire) tonight. The NHS Confederation has published an article on the 'listening revolution', written by Mike Connolly, the lead trainer for SAGE & THYME, see: http://www.nhsconfed.org/blog. In the blog, Mike reflects on how important it is for busy NHS staff to have the skills to listen to patients, despite the pressures that staff are currently facing. Bookings are now being taken for our annual conference and training update, taking place on Tues 24 Nov 2015, in Manchester. The conference is always a popular event with SAGE & THYME facilitators and others interested in learning more about the SAGE & THYME training. The early bird fee of £60 per delegate is available until 30 September 2015 - the full fee charged from 1 October 2015 will be £80 per delegate. Please click here for more information and to view the draft programme and booking form. UHSM is running training in London! For the first time, UHSM will be running SAGE & THYME Foundation Level workshops and SATFAC courses in Lumen Rooms in London (near Euston station). 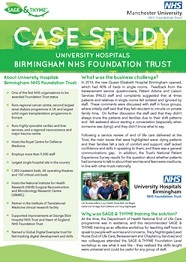 In the past, UHSM has only run workshops and courses outside of Manchester for customers who could fill all the spaces. But, in response to customer demand, UHSM is trialling running training, in October and November, that any customers can access. For the date of the SAGE & THYME Foundation Level workshops click here and for the SATFAC course dates click here. 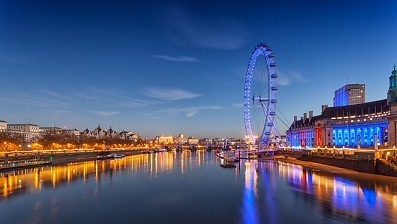 Read more about UHSM is running training in London! The Royal Marsden Manual of Clinical Nursing Procedures is in its 9th edition, and is regarded as one of the best nursing textbooks available. The SAGE & THYME team is pleased to announce that the manual now features a section on the SAGE & THYME model and its evidence base. 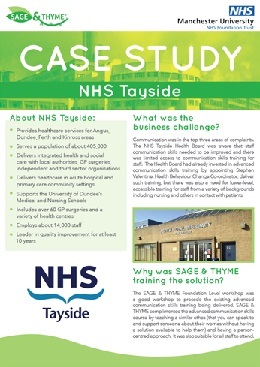 This demonstrates that the SAGE & THYME approach is becoming embedded in routine clinical practice. For more information on the Manual click here. Nursing and midwifery students at King's College London (King's) are now being taught how to use the SAGE & THYME model to help them to listen and respond to patient concerns. King's has recently signed a licence to run the SAGE & THYME foundation level workshops and has trained up a number of its lecturers to deliver the workshops to its students. An electronic version of a paper, on improving communication with palliative care cancer patients using the SAGE & THYME foundation level workshop, has been published by Jane Griffiths, Charlotte Wlison, Gail Ewing, Michael Connolly and Gunn Grande in the European Journal of Oncology Nursing. The paper highlights how attending the workshop, improved the district nurses' knowledge about communication behaviours helpful to patients; and that this was sustained two months after training. The district nurses also reported an increase in their confidence in communication skills, which was sustained post-workshop. In addition, the findings demonstrate that it can be difficult to control the environment when visitng a patient at home. Macmillan Cancer Support have produced a report on how to support and empower staff to deliver a good experience of care for patients. This includes ensuring that staff have the right training. The report gives an example of how the SAGE & THYME foundation level workshop has been successfully run by Macmillan Cancer Support in London in partnership with a number of NHS Trusts: the feedback from University College London Hospital "has been excellent". The 4th annual SAGE & THYME UK conference was held yesterday. It was attended by over 60 SAGE & THYME facilitators from around the UK, to hear the latest developments on SAGE & THYME, and to network and make contacts with facilitators from other organisations. The conference was opened by Felicity Goodey CBE DL, Chair of University Hospitals of South Manchester NHS Foundation Trust and former BBC journalist, who said that she had attended a few courses in her time, but had never attended one that was "more patient focussed, more effective and better run", than the SAGE & THYME foundation level workshop. The 4th SAGE & THYME UK annual conference programme has now been released. Visit the News page to download the programme. To book a place please contact us - places are £65 per person. The details of the 2014 SAGE & THYME UK conference, which will take place on Wed 19 November 2014 in Manchester, have now been released. As always, the conference will consist of a mixture of presentations and parallel workshops involving a number of speakers from organisations running the SAGE & THYME foundation level workshops in addition to the SAGE & THYME Team. The conference costs £65 per person - for more information click here. Following the independent review of the Liverpool Care Pathway, the government has published 'One Chance to Get It Right'. This report summarises the system wide response to the review. It highlights five new priorities of care and mentions SAGE & THYME as a communication skills training development resource. Mandatory communication skills training is the second recommendation in the 'National care of the dying audit for hospitals England' published last month by the Royal College of Physicians and the Marie Curie Palliative Care Institute Liverpool. The SAGE & THYME Foundation Level workshop is suitable for providing training to all types and levels of staff in general communication skills; and the SAGE & THYME for Advance Care Planning and End of Life Care workshop is appropriate for more senior staff who discuss advance care planning with patients and their relatives/carers. Nottingham University Hospitals NHS Trust presented the findings of their evaluation of the SAGE & THYME Foundation Level workshop, at UK Kidney Week in Glasgow on 2 May. The second paper reporting on the evaluation of the SAGE & THYME Foundation Level workshop has now been published in the Journal of Continuing Education in the Health Professions. SAGE & THYME training was represented on the ‘Manchester: health is our business’ stand at the annual NHS Expo, which took place in Manchester on 3 and 4 March. The conference covered a range of NHS issues including care and compassion and the 6Cs initiative being promoted by NHS England. The 6Cs are: care, compassion, competence, communication, commitment and courage. They were originally developed for nurses, but NHS England now hopes to expand the approach to the whole of the NHS workforce. 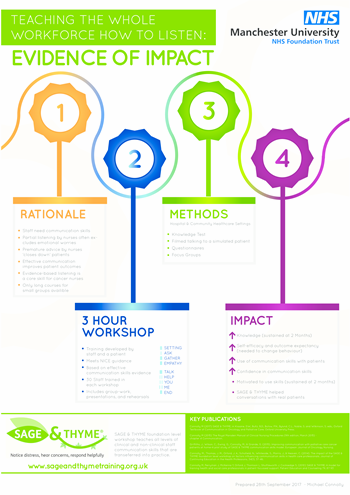 The SAGE & THYME Foundation level workshop addresses four of the 6Cs. The first SAGE & THYME for advance care planning (ACP) workshop, open to anyone involved in advance care planning in the UK, has been scheduled for Friday 23 May 2014 at Wythenshawe Hospital in Manchester. The SAGE & THYME Team are now back to work after the Christmas break. We would like to wish all of our SAGE & THYME facilitators and their associates a happy New Year. Please note that the SAGE & THYME office will close for Christmas on the afternoon of Tuesday 24th December and will re-open on Friday 3rd January 2014. The date for next year's SAGE & THYME UK conference has now been set for Wednesday 19 November 2014 at Wythenshawe Hospital in Manchester. Please save this date in your diary. Further details will be available closer to the event. The presentations from the SAGE & THYME UK conference 2013, held in Manchester last month, are now available on the trainer area of the web site. The SAGE & THYME UK 2014 conference programme is now available. The closing date for bookings is Fri 11 Oct 2013 and places will be allocated on a first-come-first-served basis. Bookings are now open for this year's SAGE & THYME UK conference, which is taking place on Thursday 14 November 2013 at Wythenshawe Hospital in Manchester. The conference will run from 9:30am-4:00pm and will contain a mix of presentations and workshops. The programme is aimed at people who are existing SAGE & THYME facilitators and those people who are interested in running SAGE & THYME workshops in their organisation. The SAGE & THYME Team is pleased to announce that a map is now available on this web site that indicates which organisations currently hold a licence to run SAGE & THYME foundation level workshops. 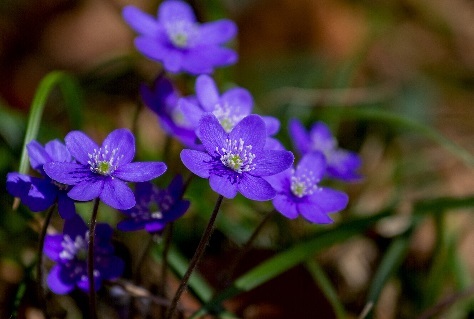 The latest edition of the National End of Life Care Programme newsletter features an article on the original SAGE & THYME training (the foundation level workshop) and the new SAGE & THYME for advance care planning workshop. 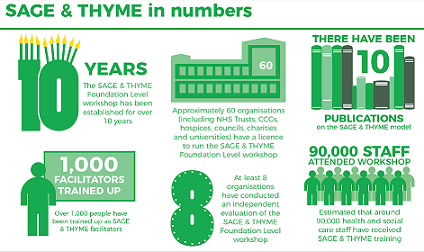 A recent survey, conducted by the National Cancer Action Team and looking at the changes that have been made in NHS Trusts to improve cancer patient experience, has found that many of the Trusts had rolled out the SAGE & THYME Foundation Level training. The date for the third SAGE & THYME conference has been scheduled for Thursday 14 November 2013 in Manchester. The SAGE & THYME team are pleased to announce that the 40th licence agreement to run the SAGE & THYME foundation level workshops has just been signed. The second SAGE & THYME conference was held for SAGE & THYME facilitators on Thursday 1 November. Around 70 people attended the conference - almost double that of last year. The day included a mix of formal presentations, training and open space discussions and the feedback from the delegates was very positive. The date for next year's conference has been set for Thursday 14 November 2013. We are pleased to announce that we are holding our second conference for SAGE & THYME facilitators on Thurs 1 November 2012 in Manchester. This is our second annual conference for both recently trained and more experienced SAGE & THYME facilitators. The SAGE & THYME foundation level workshops have been run by Central Manchester University Hospitals NHS Foundation Trust’s (CMFT) renal unit to improve staff communication skills. CMFT’s evaluation has been published in the ‘Getting It Right’ report (available from NHS Kidney Care). NHS Kidney Care invited the SAGE & THYME Team to run an e-seminar in collaboration with the multi-disciplinary renal staff at CMFT.